I got a text last night from Shamir worriedly asking if we could change the time for our appointment from 7:00pm to earlier in the day. He had been checking the weather oh, about every 5 minutes, for the last week straight to make sure there would be no rain to ruin one of the biggest moments of his life. 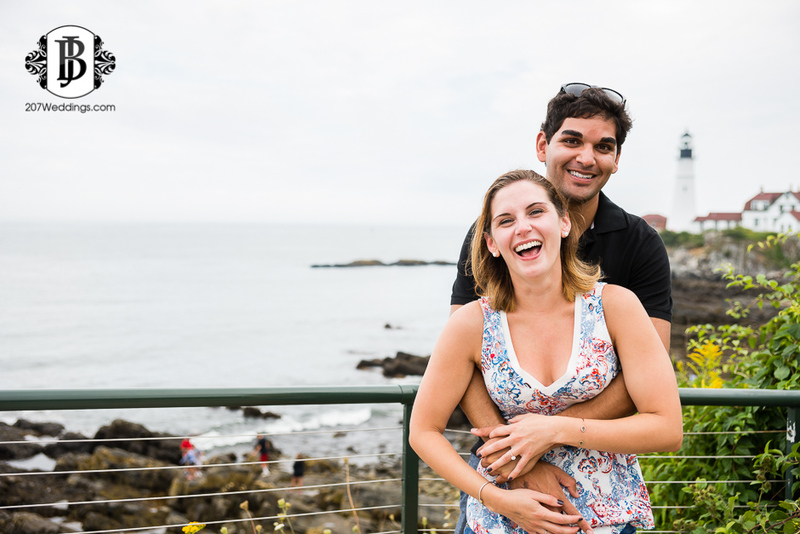 We coordinated, planned, mapped and texted everything out, and the weather (and light) at Portland Head Light in Cape Elizabeth was just perfect for it to take place. Not too hot, not too cool, just right with a nice, gentle sea breeze for good measure. We moved up our plans for just the right time all around. Shortly after I arrived, I waited in our rendezvous point. Then suddenly, a part of me started to panic even though I was perfectly on time - what if the plans went askew and I had missed them and they were already at the "spot" overlooking the lighthouse? What if there was a freak rain storm that closed the path off from foot traffic the night before, spoiling our plans? So I sent a text to Shamir letting him know I was at our rendezvous point so I could lead him to the spot. My heart dropped into my stomach when he said "we're on the trail." GAH! 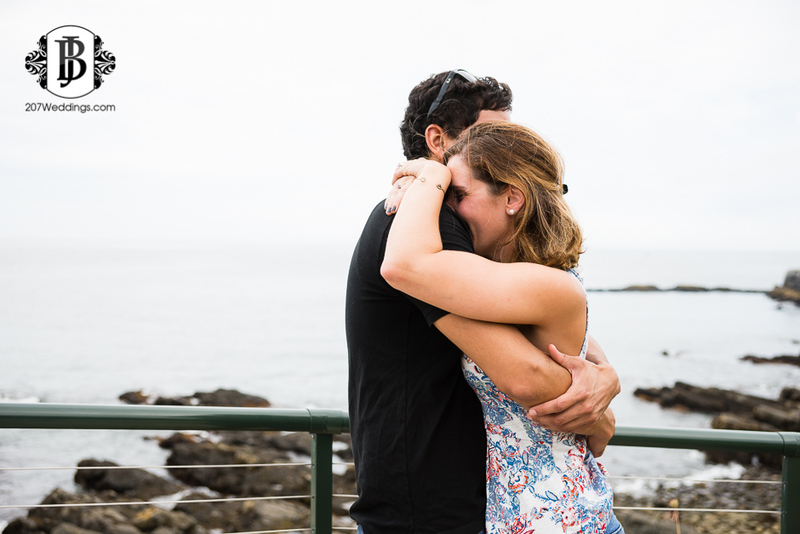 I rushed to the spot and probably leveled a tourist or two in my whirlwind to get to the spot as I prayed he hadn't already popped the question. When I got there, the couple was nowhere to be seen. My mind flashed visions of him having asked the love of his life to marry him, and I somehow wasn't there at the right time or place, even with all of our planning. Then I got a text asking if I was in place, and I said I was. PHEW! This worrying stuff gets me nowhere! Shamir was so smooth and cool when playing the whole thing off for Emily: taking selfies with the lighthouse in the background, overlooking the beautiful view of the ocean and the rocky coast, having Emily "pose for a picture" with her facing the lighthouse, back towards him while he snuck the ring box out of his pocket and glided down on one knee. It was such a surprise, she didn't even see it coming! YES! Totally pulled it off, and got some amazing images of it (see below). And even though all that worrying had crossed some weird wires for me during the shoot (mostly in the form of calling Shamir by the name of Raj almost the entire time - LOL), these two love birds were able to laugh with me, seriously rocked it out their portrait session, and now have some stunning images to preserve this moment for the rest of their lives. So gents, when it's time for you to propose to your love, take a few pointers from Shamir, and his ultra-awesome proposal to Emily at Ft. Williams! 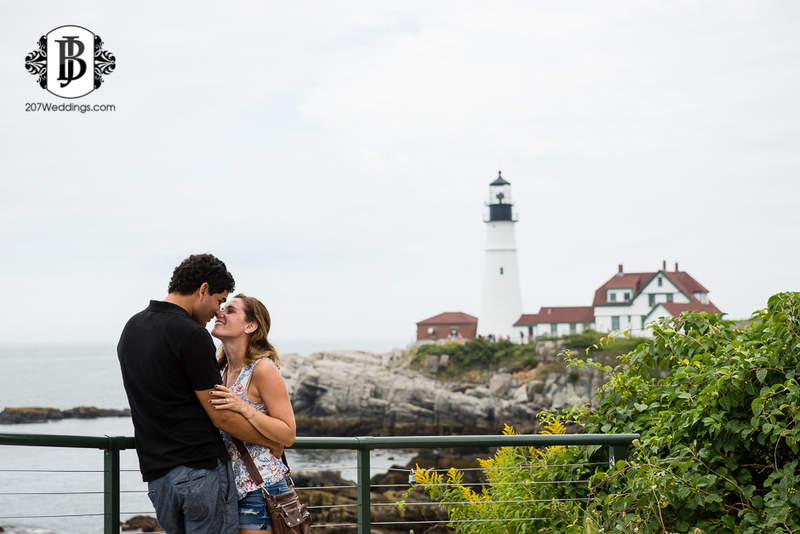 If you like what you see and would like fabulous images to capture your own surprise proposal in Maine, look no further! I'd love to chat and begin devising a plan: weddings@207weddings.com or 207-808-2151.